My friends over at Shareinvestor Thailand just launched this app yesterday and my my have I enjoyed it. 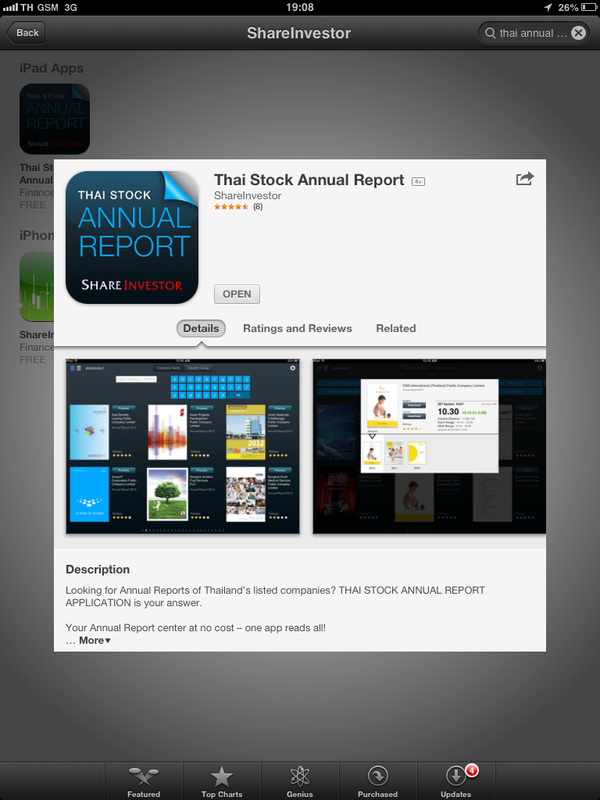 Essentially they have gathered all of their clients here in Thailand (some 150 or so) and put their annual reports (for the past 3 years) available to read in English/Thai here in this simple app. And the best news? It’s free! Only one point to nitpick, I would love it if they could have all possible annual reports here. The SET-listed Jubilee Enterprise Plc (JUBILE), a leading retailer of diamond jewellery in Thailand with nearly 100 outlets, has delivered average net profit growth of 40% per year from 2009-12, and it continued to impress shareholders with 30% year-on-year growth in this year’s first quarter. Chief financial officer Unyarat Pornprakit discusses the strategies behind the company’s success and how it plans to maintain its growth in the future. Your growth in the past three years has been impressive. How did you achieve that? We’ve been trying our best to deliver the performance we promised investors during our IPO in 2009. That was the same time that we introduced a new diamond jewellery collection, The Excellence, to reinforce our Jubilee brand value. We have refreshed our brand positioning, strengthened product designs and lineups, rebalanced product mix to optimise margins and introduced a loyalty programme. All of these have led to a higher level of brand awareness and customer base expansion. As a result, they have been reflected in our bottom-line growth. BAFS 30% earnings growth expected — BAFS expects 2013-14 earnings to grow by 30%, supported by an increase in fuel usage in Don Muang and Suvanabhumbi of 5%. It plans to expand its transportation network from Bangpa-In to Lampang, for an investment cost of Bt65bn, and expects conclusion on this by the end of this year. Its Suvanabhumbi Airport oil pipeline Phase 2 project is also in progress (Tun Hoon, 19/07/13).